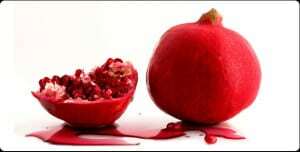 I’d like to share the best way to open, clean and eat a pomegranate with you! My family has been growing pomegranates for decades, so we’ve tried every method around. Here’s the easiest way to get the seeds (they’re actually called arils – they contain the pomegranate seed and the juice of the fruit) out of a pomegranate for eating. 3 – smack the top of the pomegranate with a large spoon (I use a wooden one) so the arils fall into the bowl. rotate the pomegranate half so you can remove all the arils. 4- repeat with the other half of the pomegranate, then throw out the rind and enjoy the fruits of your labor! Line a sheet pan (or flat-bottomed pan that will fit in your freezer) with wax or parchment paper. Spread the arils out in a single layer on the pan, and freeze for 4-6 hours. Then pour the frozen arils into a freezer bag or airtight container. They’ll be individually frozen for easy use. This entry was posted in Articles, Gluten Free Advice + Experts, KC's Blog, Tips & Tricks and tagged eat a pomegranate, food facts, G-Free Foodie, ingredients, kc cornwell, pomegranate recipes, pomegranates. Bookmark the permalink. Pomegranates have always been one of my favorite fruits! I don’t think I ever knew you could freeze them, thanks for the tip! Love this! I’m always that person who chickens out and pays extra for the cases of the seeds at the produce deptartment :/ Looks fun to whack it though 🙂 lol! Such great info, and I love the video! I love fresh pomegranate seeds! Great tip to freeze them!